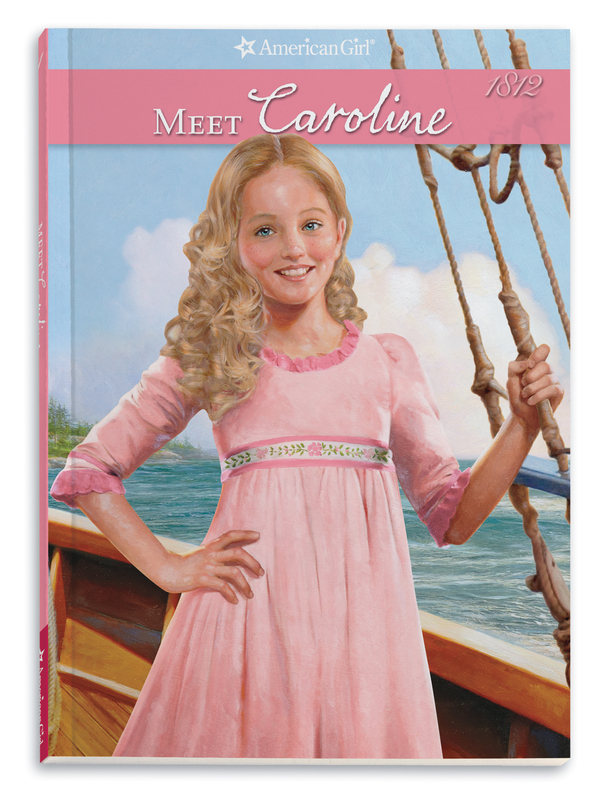 When I was a kid, I read about a girl in colonial times whose family had kept a crock of sourdough going from generation to generation. 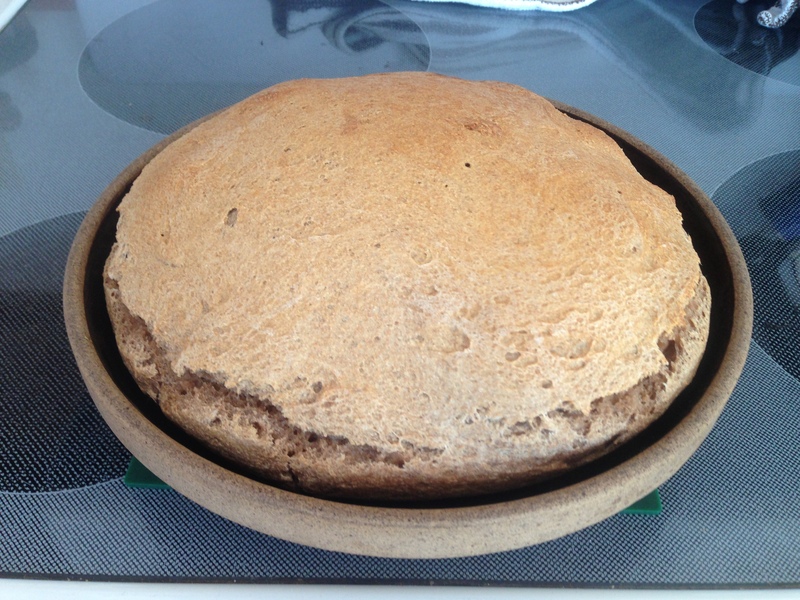 I’ve been fascinated with the idea of making bread with sourdough starter ever since. Our great-great-grandmothers used sourdough starter to make bread rise in the days before commercial quick-rise yeasts were available. The starter nurtures naturally-occurring yeasts and bacteria. 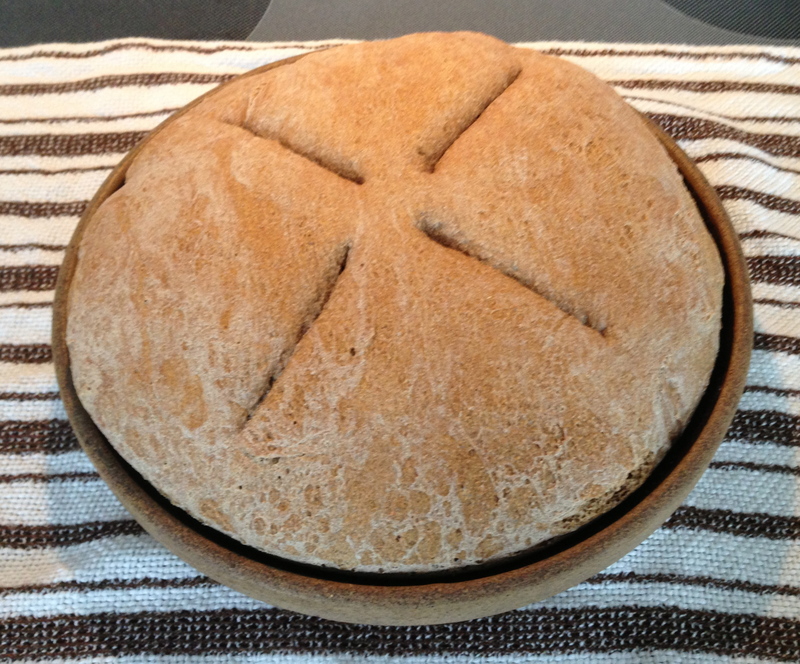 This is the type of bread mentioned in Meet Caroline. Want to give it a try? It’s a fun inter-generational project. Working with sourdough requires patience and practice, but the basic process is quite simple. There are probably as many recipes for bread baked from homemade sourdough starter as there are bakers. I’m sharing the process that has, after a fair amount of experimentation, worked for me. 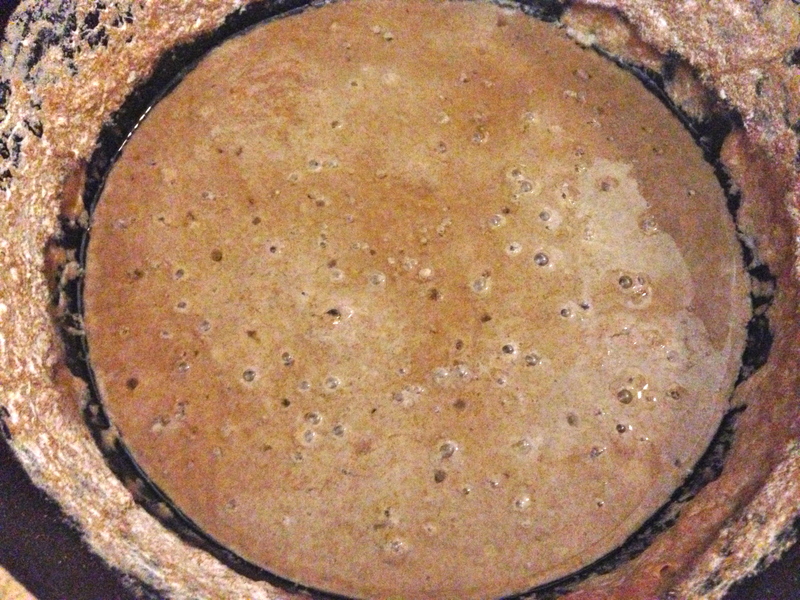 Baking without commercial yeast means that the process takes a while. I make starter on a Saturday, tend it for a week, and bake the following weekend. 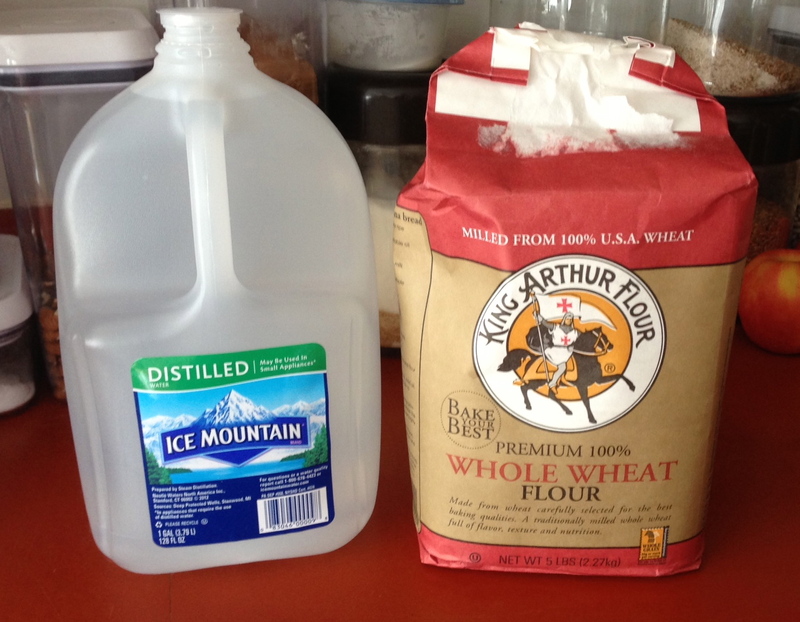 All you need to begin is flour and water. 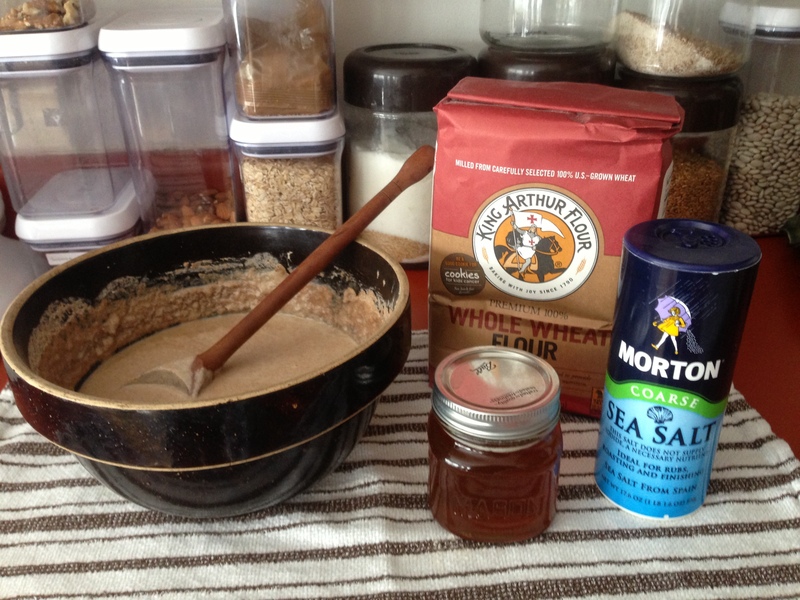 Use a good-quality whole-grain flour. Flour which has been heavily processed might contain traces of chemicals that could kill the rise. For your first batch I suggest using distilled water for the same reason. Once you’ve had success, you can try using tap water or other types of flour. Stir 2 c. flour and 2 c. water together. I use my grandma’s mixing bowl. Cover with a towel and let rest at in a warm spot—about 70 degrees is ideal. If it’s colder, the microorganisms will grow more slowly. My starter lives on the kitchen counter. Stir 1/4 c. of flour and 1/4 c. water into the starter. Cover with a towel. After a day or so you should see bubbles forming. The starter will develop a pleasantly sour smell. It should not change color; if it turns black or takes on a pinkish tinge, discard. The starter should get a little more active and frothy each day. The yeast in the air and flour are happily consuming the flour’s natural sugar, and releasing carbon dioxide bubbles. The starter is about the consistency of pancake batter. 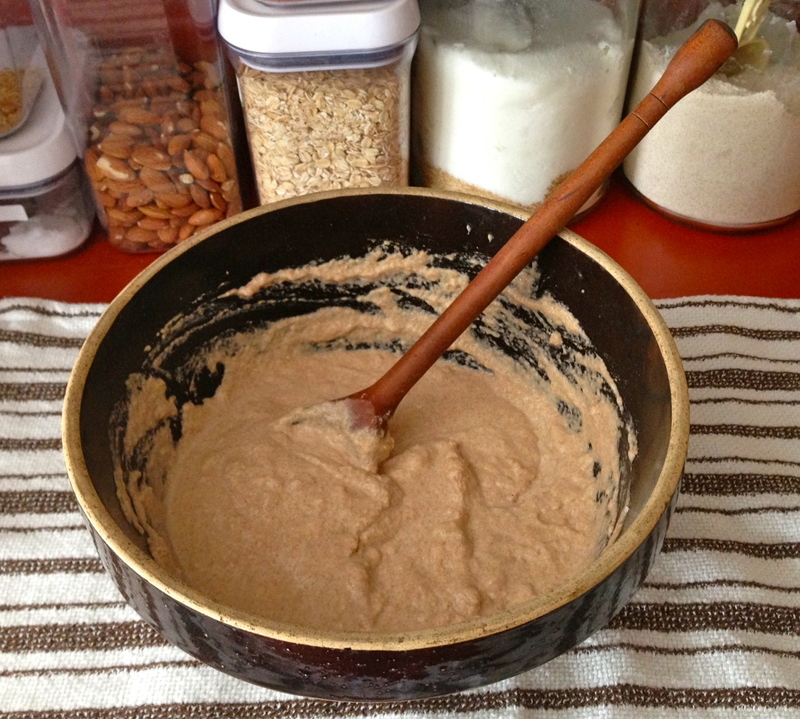 Remove 2 cups of starter and place in a clean bowl. Stir in 4 cups of flour, 1-1/4 c. water, 2 t. salt, and 2 T. honey. (You can use sugar if you don’t have honey on hand.) 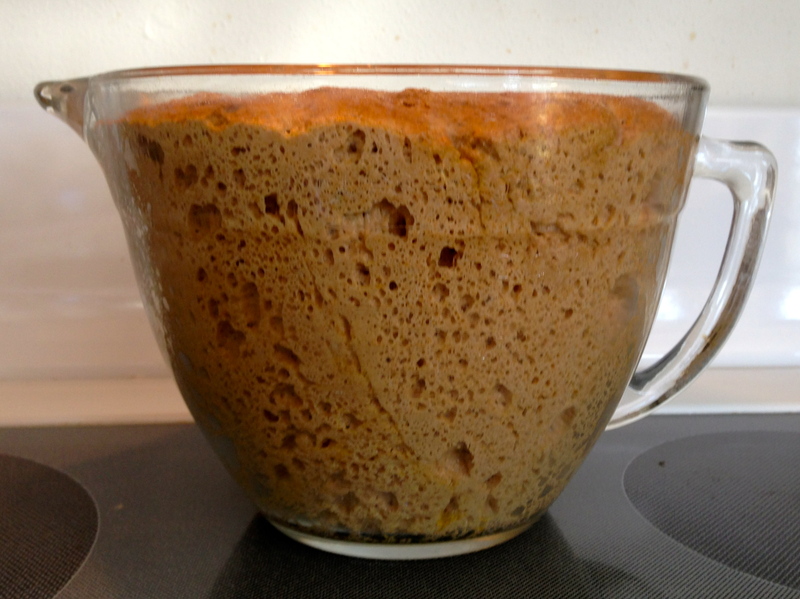 If the result is too sticky to knead, add more flour a little at a time, just until the mass holds together. 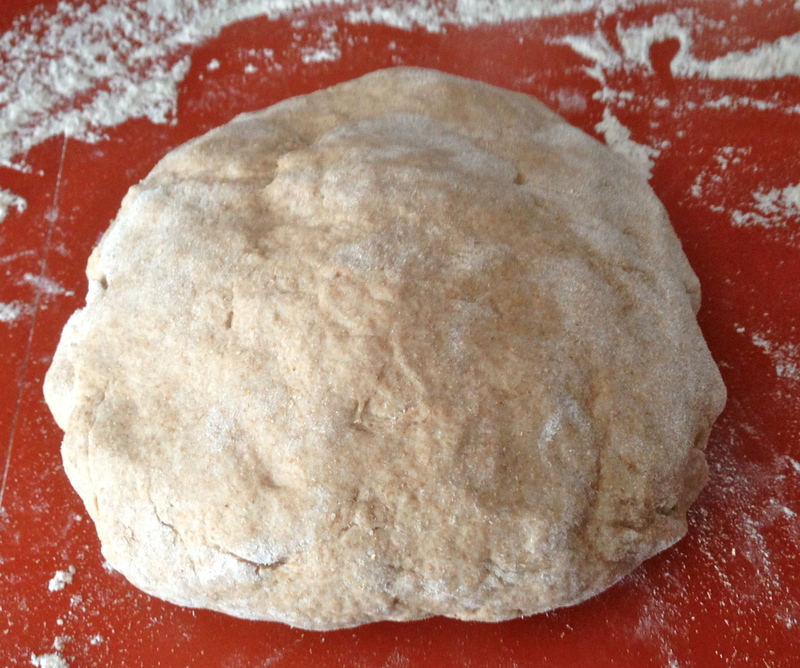 Knead the dough on a counter or bread board until smooth, about 5-10 minutes. 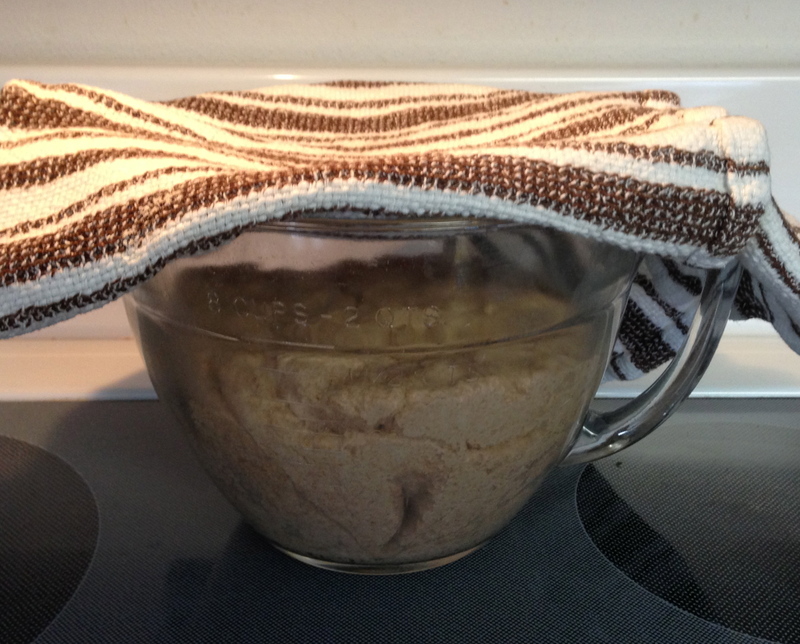 Place the dough in a lightly greased bowl, cover with a towel, and set in a warm place. Let the dough rise for 8-12 hours. Give or take. I mix the dough right before going to bed and let it rest overnight. …and after 12 hours. The glass bowl reveals all the action taking place in the dough. 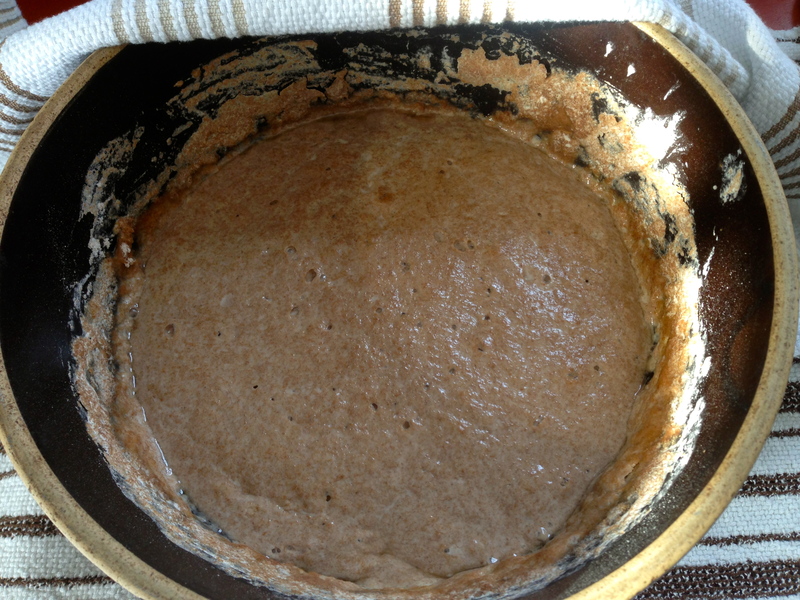 Lightly grease a pie plate and gently place the risen dough in the center. You could use a cast iron skillet, too. 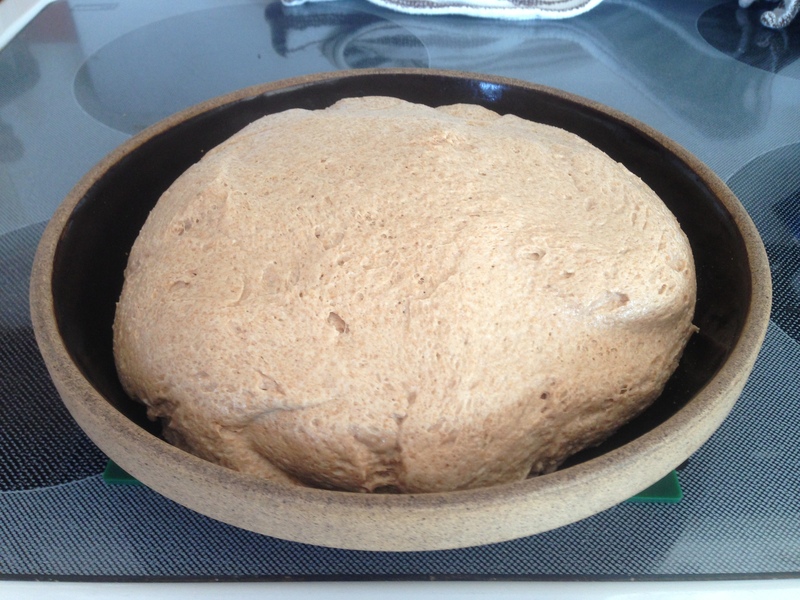 The dough should feel puffy and active. Cover with a damp towel and let rise 4-6 hours. Make several slashes about 1/2″ deep in the top of the loaf with a sharp knife. Bake at 350 degrees for 45-50 minutes, or until the top is golden brown and a toothpick tester emerges dry. 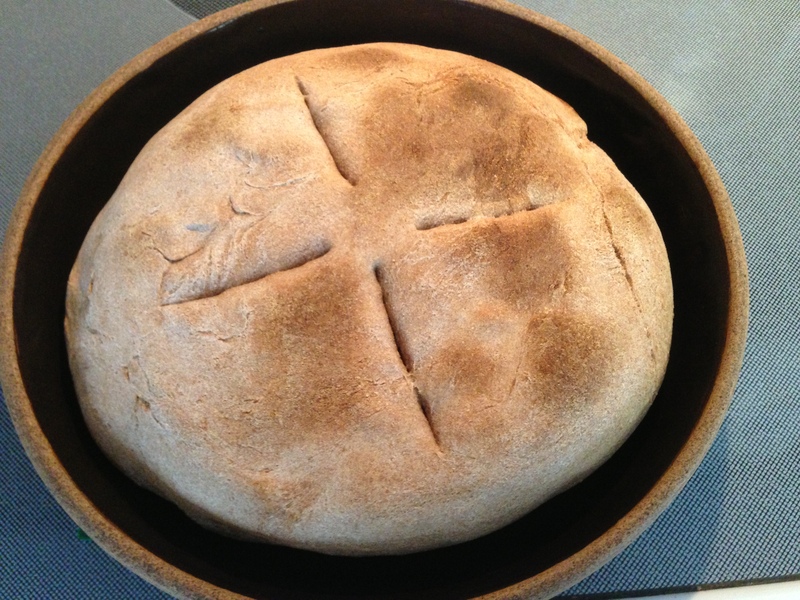 After you’ve had success, you can experiment by using different types of flour and adding herbs, fruit, etc. 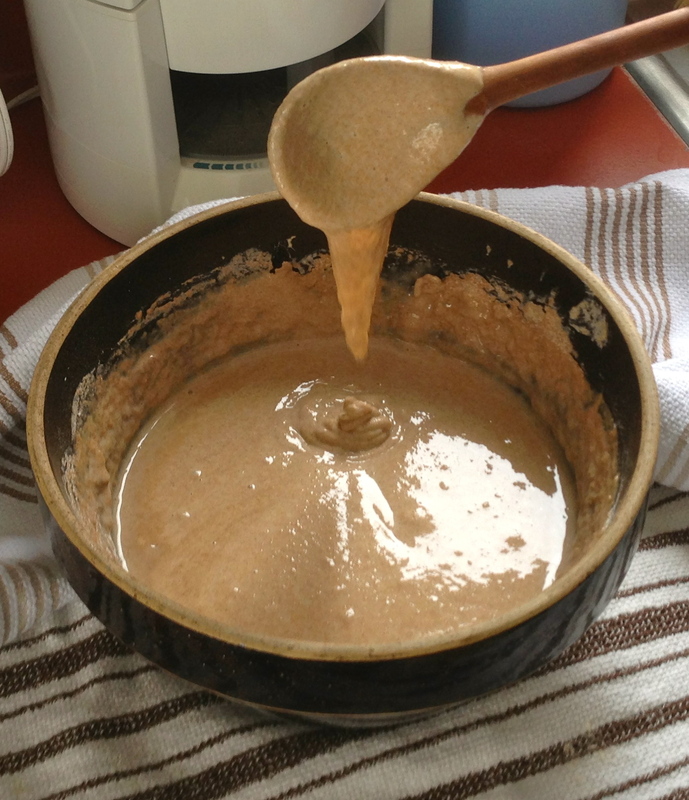 If you want to keep your starter going, spoon what was left in the original bowl into a clean container. 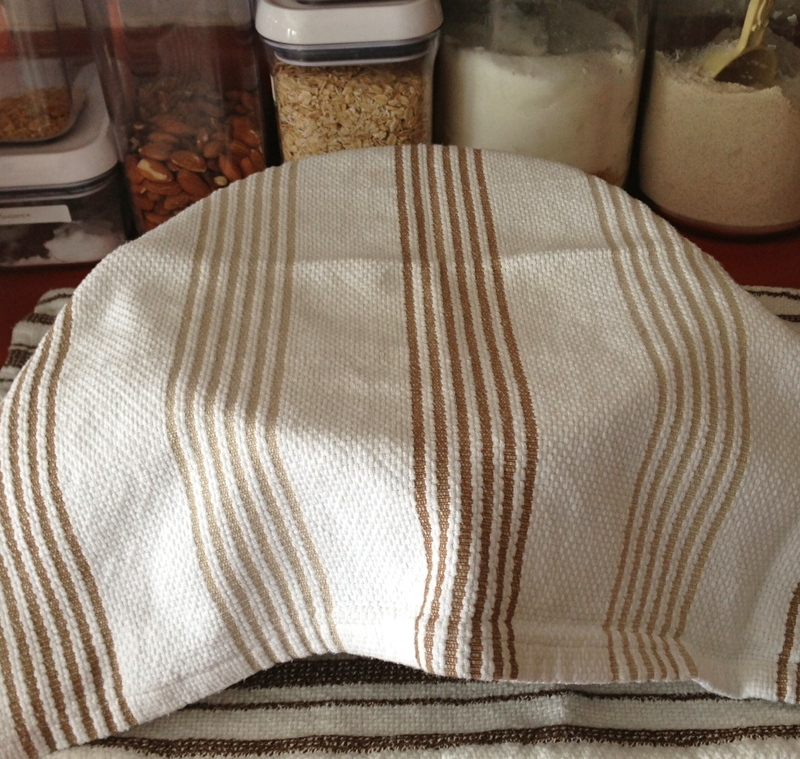 While a dry towel was necessary during the first week to allow wild yeast cells easy access, the starter now needs more protection to keep a crust from forming. Caroline might have used a crock with lid left a bit ajar. You can use a bowl covered with a plate. Grandmother was teaching Caroline how to make bread, but somehow, Caroline never seemed able to mix in just the right amount of flour and water, or knead the dough to the perfect silky-smooth texture. Her loaves turned out heavy and hard. Like Caroline, I had a few failures on the way to a good loaf of sourdough bread. This is what happened when I didn’t give the dough enough time to rise. And this is what happened when I forgot to slash the top of the loaf. Steam split the loaf along the sides. It tasted OK, but didn’t look nice. So don’t be discouraged if it takes you a couple of tries to produce a successful loaf of bread with homemade sourdough starter. The results are worth it! 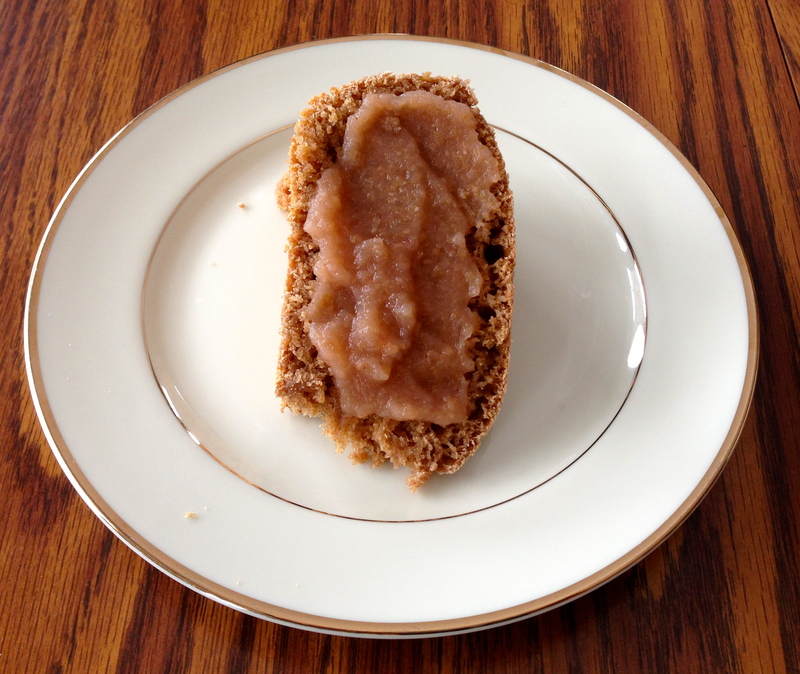 Still warm and spread with homemade apple butter – yum! This entry was posted on March 9, 2014 at 4:02 pm and is filed under Caroline Abbott books, FOODWAYS. You can follow any responses to this entry through the RSS 2.0 feed. You can leave a response, or trackback from your own site. this seems quite easy, but I wonder how it would go in a sub tropical climate? I’d think it would work…warm is better than cold. It might just take some experimentation. If you try it, let me know how it turns out! So this is how you make sourdough!